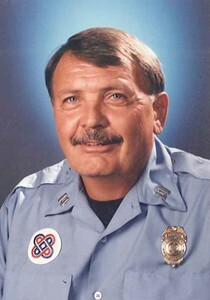 Ival R. Pruter, KCFD Captain Ret. 78, of Olathe, KS passed away Oct. 27, 2015. Funeral services will be 2PM Sunday, Nov. 1st at Penwell-Gabel Funeral Home, Olathe Chapel. The family will receive friends from 1-2PM. Celebration of life following service at Jean/Ival’s house. Private inurnment will be at Leavenworth National Cemetery. Ival was born Dec. 16, 1936 in Osborne, KS to Alvin and Yvonne Pruter. He graduated from Natoma High School in 1955. He went on to serve in the US Navy, then 39 years of dedicated service with KCFD, He married Nellie Thurston in 1959-71. He was preceded in death by his parents and his brother Keith Pruter. He is survived by his beloved wife of 33 years L. Jean Pruter of the home. Their children Kim Trout, Tona Steinberg (Dan) and Troy Pruter (Tara), 3 grandchildren, Emily, Ashley, & Abigal and 3 great grandchildren. He is also survived by his brother Orville (Betty) Pruter of Natoma Ks. And many friends and extended family. To leave a special message for the family please click the "share memories" tab above. Add your memories to the guest book of Ival Pruter. Ival was such a kind heart, and he would brighten our day when he would stop by the pharmacy to say hello. We truly regret not being able to attend the services, but want you to know how much we enjoyed him, and how we are thinking of his family during this time. For 13 of my 25 years on the fire department, I worked for Ival as a Firefighter. At a time I loved going to work. I am sure that all who called on him in an emergency left him with a 'job well done' Thank you. Just as I did as a firefighter, just as I do as a friend. Now to his family, a trinity of wishes for you all. Those being comfort, peace, and continued blessings. I worked with Ival at Fire Station # 2 from 1974 till 1977. Then in 1980 I was his driver at 18's on P-11 till 1985 when I left because of being promoted to Capt. I enjoyed working with him & respected him as a very good Fireman. Saw him fight a lot of good fires.